The Orichal range is perfectionist in its simplicity featuring a precision engineered solid brass frame with a top in either oak or walnut. Shown here in black lacquered walnut and brushed brass Each Stuart Scott piece is built by hand in our workshop in Wiltshire, England. Nothing is mass-produced. This ensures complete attention to detail, structural integrity and sheer build quality. We never compromise. When we finish each piece, it is signed and numbered: a unique handmade masterpiece. Customers can choose from the following timber finishes: Oak - Oiled, Aged, Ebonised or Ebony / White *Limed. Walnut - Oiled, Ebonised, Black Lacquered or Ebony *Limed. *Liming carries an up-charge of £120.00 per table. Customers may also choose from the following metal finishes: Natural Brass, or **Bronzed Brass. 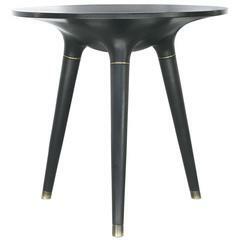 **Bronzed Brass carries an up-charge of £180.00 per table. 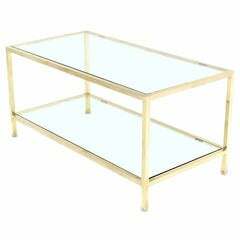 Very fine metal craftsmanship solid brass tube coffee table in style of Paul McCobb. Beautiful coffee table covered in walnut. 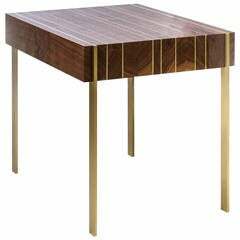 The legs are covered with brass plates Measurements: cm 80 × 80 height 30.